Solar photovoltaic (PV) concentrator systems can be divided into two broad categories: point-focus systems typically utilizing square Fresnel lenses, parabolic dishes and central receivers; and line-focus systems typically utilizing linear Fresnel lenses and parabolic troughs. The illumination intensity is typically 10 – 50Wcm2 for the point-focus category and 1 –5Wcm2 for the linefocus category, compared with 0.1Wcm2 for non-concentrated sunlight. 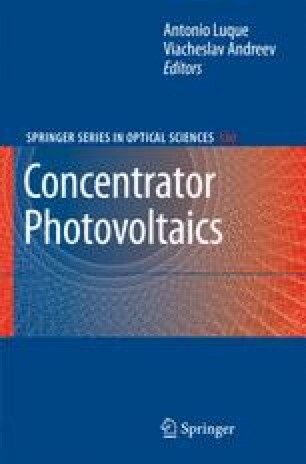 This chapter summarizes the design of silicon solar cells for use in pointfocus and line-focus solar concentrator systems. The differences between solar cells designed for high and moderate concentration are described, along with the conflicting requirements for operation under concentration. Cell design is related to the design of other parts of the optical concentrator where the latter places particular constraints on the former. The cost of a point-focus solar concentration system per square metre of collection area is larger than the cost of a line-focus system, which in turn is larger than the area-related balance-of-systems costs of a non-concentrating photovoltaic system. It therefore makes economic sense to use highly efficient solar cells in point-focus concentrator systems, even though the solar cell cost per square centimetre is high. In a line-focus concentrator system, the requirement for high efficiency is relaxed in favour of reduced cost, since the concentration ratio is about ten times smaller and the area of solar cell required is therefore ten times larger.